In the early 20th Century in Minneapolis, when children were forced to work long hours in factories, a marching band was formed to keep these boys off the streets and improve their lives through music and teamwork. This is a subject that is begging to be made into a musical, and the History Theatre has obliged with The Working Boys Band, directed by Ron Peluso, with book and lyrics by Dominic Orlando and music by recently deceased local composer Hiram Titus. 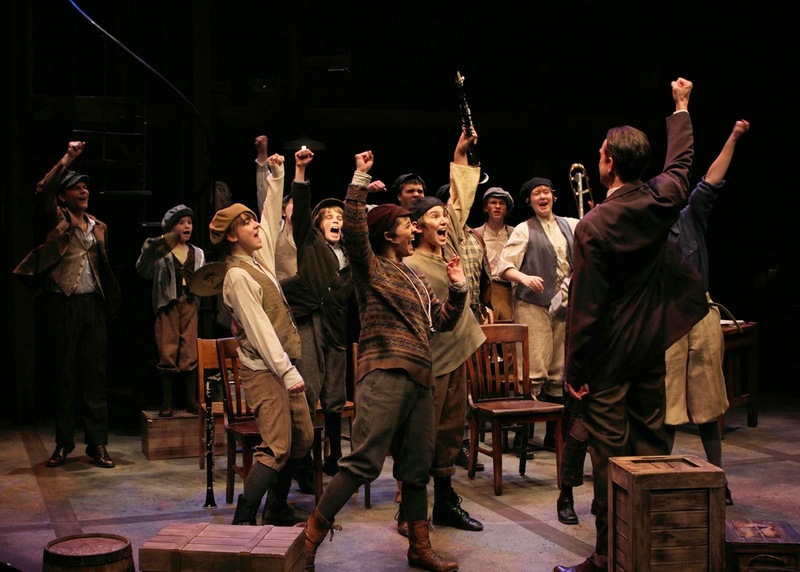 Part Newsies, part The Music Man, and part Dead Poet's Society, The Working Boys Band isn't a particularly original musical, but it is a fun and feel-good musical about the power of music as it played out in local history. Like Professor Harold Hill did for the people of River City, Professor C.C. Heintzman (based on a real person) gave the working boys in WWI era Minneapolis a love of music and sense of community and teamwork. In other words, "manliness, integrity, intelligence, and kindness" as the song goes. He faced obstacles - unruly boys coming late to rehearsal, 21-year-old Franky who joins the band to dodge the draft, and a community board that wants to fire him because of his German heritage - but he and the music came out on top in the end (as required in any feel-good musical such as this). The History Theatre stage is teeming with talented young men (and women!) of all ages and sizes playing the dozen or so boys in the band, a mix of professional actors and children studying music and/or theater in school. They're all fantastic, hitting their marks and saying their lines on cue with great energy and enthusiasm, staying present in the scene even if they don't have lines. The true joy of this show is watching these youngsters gleefully perform. After so many supporting roles, it's nice to see Jon Andrew Hegge in the lead role of the Professor. He really shines in the spotlight, creating a strong and sympathetic character. And Kendall Anne Thompson as Harriet, the woman working with the boys and falling in love with the professor, is always welcome with her lovely voice. Jen Burleigh-Bentz gives a deliciously nasty performance as the Cruella De Vil-esque Mrs. Winter. I didn't quite follow all of the politics involved, but all you need to know is that she's the bad guy trying to spoil the fun and stop the music, while adding to the fun of the show, giving the boys and the audience a villain to root against. Like he did in Ten Thousand Things' truly delightful production of The Music Man, Ricardo Vasquez once again plays a young man whose playing of the coronet in the band gives him confidence and a sense of purpose. Franky is a bit older than Winthrop, but both are suffering the absence of a father and a feeling of being lost. Christian Bardin is our plucky drum major Andy, who just happens to be a girl disguised as a boy to more safely live on the streets, and so of course she falls in love with Franky. This leads to some confusion and a really lovely quartet "Moonlight, Loring Park" by Andy, Franky, Harriet, and the Professor. A standout among the kids is Keegan L. Robinson as Bjorn, the first chair coronet player, with a strong voice and confident stage presence. The music is typical musical theater stuff, and the choreography (by Cat Brindisi, adding to her already long list of talents) is organic to the story and characters. The rough and rustic two-story set by Rick Polenek and beautifully polished or unkempt period costumes by Kathy Kohl create the world in which the story takes place. I love a marching band, and happily the boys do get it together to play and march around the theater like a real marching band. I would have loved to have heard even more from them! If you're looking for a fun, feel-good musical with great performances by professionals and kids alike, look no further. 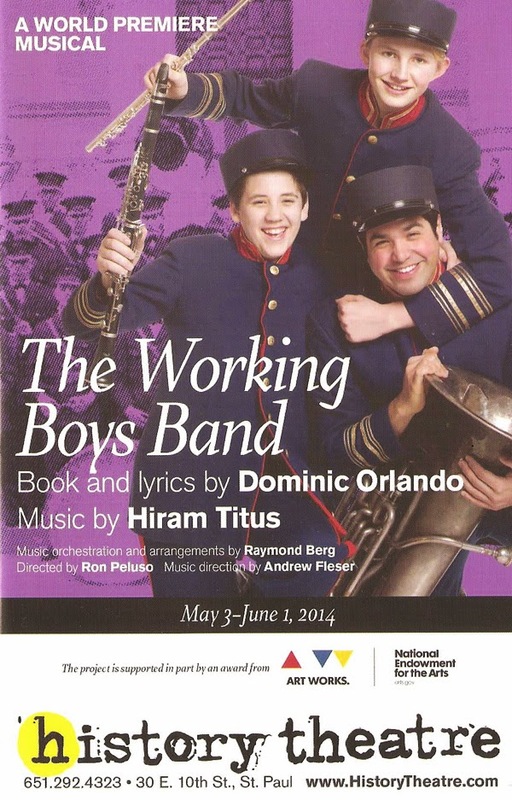 The Working Boys Band is playing at the History Theatre through June 1 (discount tickets available on Goldstar).